Could Orkney lead the way in generating low carbon electricity? Peak modelled tidal currents in Orkney watersMarine renewable energy experts at Bangor University have published a new study which examines the potential of Orkney, in the north of Scotland, to generate low carbon electricity through tidal turbines. The study was conducted by researchers from the Ocean Physics group at the University’s School of Ocean Sciences. “With recent access to supercomputer power, through the High Performance Computing Wales project, we have been able to run three-dimensional ocean models of regions around the world at very high resolution. This allows us to take a much more in-depth look at the tidal energy resource, and analyse how it varies over time and space. We can also incorporate mathematical equations in our models which simulate the extraction of energy, and any potential effects which energy extraction could have on the environment”. This research is the first of a number of outputs planned for an EPSRC SuperGen project, in which a consortium of researchers at Bangor, Cardiff, Cranford, Liverpool and Swansea universities are examining the effects of realistic ocean conditions on the performance of tidal stream turbines. Neill, S.P., Hashemi, M.R. 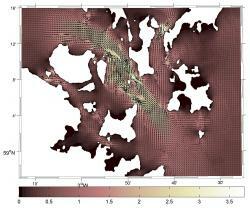 and Lewis, M.J. (2014) The role of tidal asymmetry in characterizing the tidal energy resource of Orkney. Renewable Energy 68, 337-350.